The Bicycle is an intimate look at AIDS through one man's eyes. It is the sobering yet inspirational story of how local communities can join up with global medical experts to battle the world's deadliest pandemic—and win. Pax Chingawale pedals his bicycle over twenty kilometers a day, visiting his neighbors from house to house. 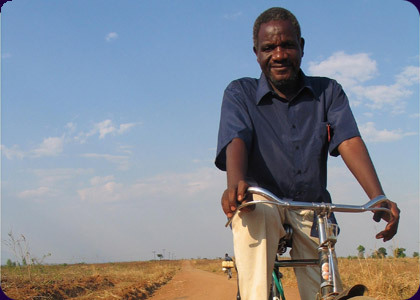 His travels take him to twenty villages in Zomba District, southern Malawi, Africa. The film chronicles Pax's journeys as he battles AIDS at the grassroots. Pax works with traditional healers who are influential at the local level yet often contribute unwittingly to the spread of the disease. He bikes around in search of the abandoned and the ill while monitoring the progress of those whose lives are being saved by ARVs (Anti Retro-Virals), a life-extending drug treatment. Pax is not a doctor or nurse. He's a retired government auditor who volunteers with Canada's Dignitas. Dignitas is headed by Dr. James Orbinski, who accepted the Nobel Peace Prize for Médecins Sans Frontières in 1999. Katerina Cizek's films have helped instigate criminal investigation, changed UN policies and have been screened as evidence at the International Criminal Tribunal. Currently she is developing an experimental program with the National Film Board (NFB) of Canada called Filmmaker-in-Residence—a program that partners media with medicine in order to effect social and political change. Cizek's recent film about new technologies and human rights, Seeing Is Believing (co-directed with Peter Wintonick), won the prestigious Abraham Prize. She is a two-time Gemini nominee, and the co-recipient of a 2000 Montreal New Talent Award. Cizek has also made films on the Czech Velvet Revolution; worked in Aboriginal Gang Territory; investigated a global people-smuggling ring; and directed a series of reports about the battle over water in Central Asia. Gerry Flahive has produced more than forty NFB Films including the Genie Award-winning Just Watch Me: Trudeau and the '70s Generation, McLuhan's Wake, The Next Big Thing, and the cult hit Project Grizzly, which he executive-produced. In 2004 he produced the award-winning film It's a Girl's World, a documentary about social bullying among girls that became the top-selling NFB DVD in 2005. His recent projects include producing the award-winning House Calls, Cricket and the Meaning of Life, This Beggar's Description, and co-producing the critically acclaimed films Souvenir of Canada and Manufactured Landscapes. Currently, he is producing the NFB Filmmaker-in-Residence, an experimental community-based alternative model of media-making that partners media with medicine.